AIM Solder provides high-quality solder alloys to the electronics industry. Please contact us if you need any assistance in determining which alloy is best for your applications. Zero defect wave soldering requires consistent solder quality. Contaminants and high oxide levels in bar solder can result in wave soldering defects such as bridging, icicling, and non-wetting. In order to avoid these problems, users of bar solder are encouraged to utilize AIM’s high-purity and low drossing bar solder alloys, which are made to some of the most stringent specifications in the industry. AIM Electropure™ Bar Solder Alloys are processed from virgin metals in a proprietary method that removes contaminants and reduces dissolved oxides to a minimum. The result of this is an extremely pure, low drossing solder bar that increases throughput and decreases defects. 500 pounds of each type of alloy was heated in a wave solder pot at 500°F for 6 hours. The pot was de-drossed every 3 hours. After 6 hours the amount of dross generated from each type of solder was weighed. 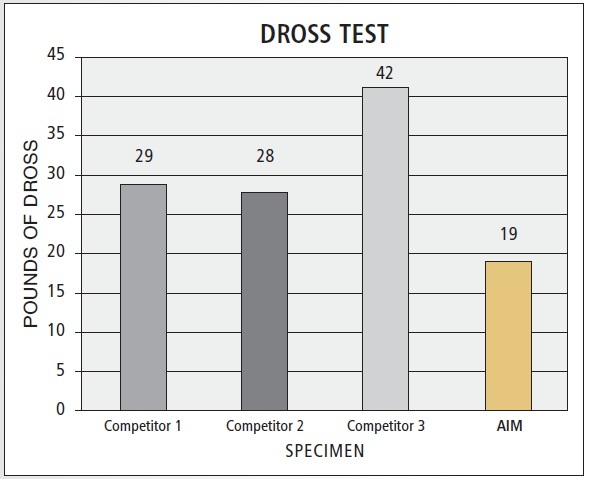 AIM’s bar solder has proven to reduce drossing as compared to competitive brands. Down hole electronics, such as oil and gas exploration, require solder alloys that have the durability to withstand the extreme thermal, geological and mechanical stresses of these applications. AIM understands system reliability is of the utmost importance, and offers a selection of high melting point solder alloys in a variety of forms which are proven to fulfill the requirements necessary for long-term reliability in solder joints.